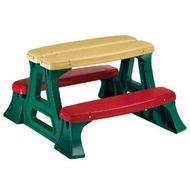 Sturdy table seats 4 children. Indoor and outdoor use. Table measures 28" x 29" x 17" and is easy to assemble. 28" x 29" x 17"